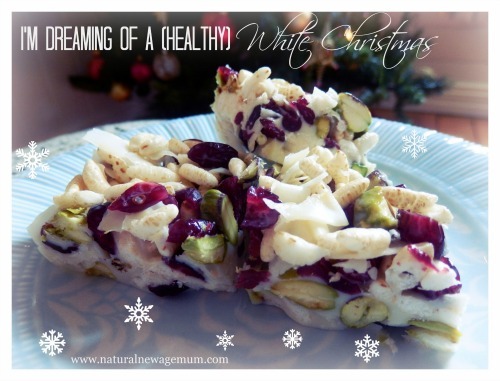 I’m dreaming of a (healthy) White Christmas! White Christmas is one of those traditional foods that only makes an appearance once a year! To be honest, I wasn’t really ever a fan. Sickly sweet with an oily copha taste….. hmmm……. My daughter and I experimented yesterday and come up with something a bit healthier and a whole lot yummier. Chuck your white chocolate and coconut oil into the thermomix. Melt on 50 degrees, 1 minute, speed 1. Throw in the rest of your ingredients and mix, reverse, speed 1 for about 20 seconds. Pour into a baking paper lined small tray (or you could fling into muffin cases). Whack into the freezer or fridge until firm and set. It must be stored in the fridge – it will melt quickly, particularly in this weather. The freezer is better! *If you don’t have a thermomix – melt the chocolate and coconut oil together in a saucepan and pour over other ingredients in a large bowl and mix well. *I don’t add any sugar or sweetener as the chocolate and craisins make it sweet enough. But try it and add some if you want to. *Use any combination of fruit and nuts you like – I just think cranberries and pistachios are so Christmasy! *If you love chocolate, try making my really healthy chocolate crackle recipe into a slice with some craisins and pistachios! Do you like White Christmas? Would you make this? Oh YUM. Pistachios and white chocolate are just the most dreamy combo – this looks fantastic! So pretty! This looks gorgeous, thank you! Love yours Sonia! Will link to it tonight when I can get onto the computer. My aim was to make my version vegan so couldn’t indulge in the white chocolate, but it would be so yummy with it like in your version!! Thanks, Sonia. I did not get around to making this recipe this year but have added the link to my food planner for Christmas 2013. I don’t have a Thermomix but I do love your fresh and healthy recipes. I pinned this last year to make this year but seeing that one of the ingredients is rice puffs has me thinking. From my reading over the year, grains which are treated under pressure to create flakes and puffs etc aren’t as great as they’re made out to be (Sally Fallon in Nourishing Traditions mentions it I think) so I wondered if you could suggest anything that might work as a substitute? I know that it is sort of one of the ingredients fundamental to White Christmas and chocolate crackles etc. Hey Jessie, yes I know! maybe just leave them out and add in some more fruit and nuts like macadamias? I don’t think so because it’s just heat (not extreme) heat popping it. I think that rice puffs and corn flakes etc are forced under extreme pressure but I could be wrong. Even so, I’d refer popcorn as I can get organic corn and pop it myself in coconut oil and ensure it’s as natural and healthy as possible. I’m wondering if cacao butter would go well, seeing as it stays more solid at room temp? Thanks for all the effort with this post – some great recipe ideas. Made this yesterday and just love it! I’ve never liked the traditional white Christmas – even aside from the questionable ingredients – but this one is delicious and also went down well with friends not so familiar with wholefood eating. So pretty & Christmassy too. I look forward to trying the chocolate version. Thanks for the recipe! Arrrrgh just started making this and only have 60g coconut oil any substitutions or need to go to shop ? Sorry Sam I was on holidays! How did you go? I made this for Xmas & loved it thanks!!! I think the rice puffs make it. Thank you ?